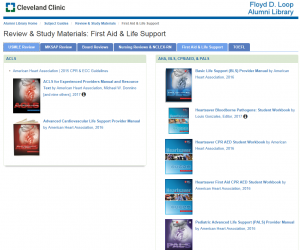 Home / LBA Profile/CaseStudy / Case Study: Online CPR books – They’re a lifesaver! 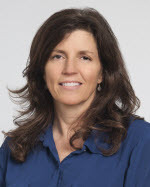 With almost 12,000 nurses and 3,700 physicians throughout our entire hospital system, the Cleveland Clinic has a never-ending need for CPR certification and recertification. Several years ago the Cleveland Clinic Alumni Library would keep three or four copies each of the print AHA manuals for Basic Life Support (BLS), Advanced Cardiac Life Support (ACLS), and Pediatric Advanced Life Support (PALS) in its collection. One copy of each was also maintained as a noncirculating “library-use only” copy. This was to ensure we always had one of each available in the event that all the circulating copies were all checked out – a common occurrence. Bumping up the print collection to 10 copies was still not enough. Many times books were returned damaged or the algorithm cards were missing, while some books never got returned at all. It soon became apparent that we could not keep enough available copies to meet the demand of our employees. In late September 2015, the digital platform provider Impelsys announced it would launch the American Heart Association eBook collection. The collection consisted of about a dozen titles, but seeing the “big 3” titles, BLS, ACLS and PALS, was enough to get my heart pumping! The eBooks would solve the problem of availability and damaged or missing print manuals. We obtained pricing, which is based on ranges of concurrent users, and we immediately went to the top range, which is 10-12 concurrent users. During any training sessions, we made sure to mention the eBook collection. We added them to our LibGuide for Review & Study Materials under their own tab, and we announced their availability directly on our Nursing Intranet. Impelsys also offers a mobile app from iPublishCentral Reader, which allows users to download the manuals onto their smartphones or iPads for several days. Patrons are always happy to hear they have mobile access. Our subscription began in April 2016 and we still announce the eBooks occasionally in the twirly. Our usage statistics for the “big 3” continues to grow: the first eight months of 2018 already well exceeds our first eight months of 2017.